Meet Brian and Skyler Thomas, a young couple in their 20s who decided to build their own tiny home. The complete tiny home on wheels is roughly 200 square-feet, but the Thomas couple surely make excellent use of it. The interior details are spectacular and unlike most tiny homes we've seen. Upon entering the double doors, you arrive at the living room and sitting area. On the wall lies important memories the couple has kept over time. In a space that is so small, there just isn't enough surface space to have/keep all of the many pictures and picture frames that we've collected over the years (thank you @dropbox for storing all of our memories digitally! ), but we came up with a solution - a picture wall above our couch. We tried to capture as much of our friends and family here + added a mix of some other important things that mean a lot to us (Brian's cross that he's been writing certain bible verses on for years, a framed version of the chorus of the song that was sung at our wedding...thanks @davieann 😁, etc.). This proves you can still have lots of pics on display in a tiny house! PS: picture collage walls are way harder than they look. The square footage may sound small, but there's enough space that even their dog can find a comfortable home. Here's the gorgeous wood countertop kitchen with built-in cabinets. The kitchen is coming together! For all of our new followers, first, you are awesome for following along and second, we've posted previously about all of the details of our kitchen. Go check that out if you want to know specifics! As a quick rundown: 1) all base cabinets are from Ikea... Sink too! 2) appliance wise, we have decided to go with a 2 burner sunken marine stove (can ya spot it?!) and a Breville oven (no microwave capabilities... If we decide that we need one, we'll add it) + an electric tea kettle for boiling water for coffee/tea. Also, not pictured is our refrigerator - a Summit 12cf fridge/freezer combo... With an ice maker! 3) our countertop is from a salvage store and was quite possibly one of the scariest things we had to cut/stain/install - definitely one of those "one-time chancers" 4) our open shelves are held up by galvanized plumbing pipe 5) our fixture above our sink is a $3 bowl from an antique store + a light kit with an Edison bulb. You really can do fixtures on a budget! 6) you can see a glimmer of our bathroom through the door there. More details in our feed about bathroom install too! Perhaps the most impressive feature is the stove. It's a dropped-in recessed Dickinson two-burner stove, typically found on boats. Because it is recessed, the couple can save precious countertop space when it's not in use. This is super trickster! Technically two pictures, but this shows you our drop-in/recessed Dickinson 2-burner propane stove (usually found in boats, actually). We were able to save a sliver of countertop so you can a) barely tell the stove is there but more importantly b) we gain that counter space when we aren't using the stove. This puppy is a bit on the pricey end, but we feel well worth it! Here's to hoping stove grease doesn't splash all over our white walls 😑. There's details in every inch of the home. When you finally get to un-box your wedding presents from 1 1/2 years ago! Moving into the tiny is really happening... And it's super surreal. Additional storage space exists opposite the kitchen. We posted a pic a bit ago that we wished had a bit more light, so here she is! A few items that are all broken down in previous posts, but here's a recap: Brian built all of the doors in this pic from scratch; the box you see to the left is a pull up desk with built in storage underneath - where I'll spend my days loving on @sugarskyshop... Please note the secret drawer in the toe kick! ; all of our "ship lap" walls are not purchased ship lap - we manually planed down scrap 2x4s; our floors are scratch-proof, water-proof and more... Aka, not true hardwoods; the cabinets are all IKEA... Seriously, the bomb; the countertop is a piece of wood from a salvage store; the shelves are self-distressed & stained wood held up by plumbing pipe; the tongue and groove ceiling was gifted from the scrap pile of @allgood77's awesome company, McShan Lumber, and the light fixture above the sink was $3 bowl from a local antique shop. To everyone that has helped make this dream come true (through prayer, physical labor, monetarily, etc. ), we are SO extremely thankful! Words cannot express! Here's to 2016 being the best year yet!!! A small staircase leads to the bed. Even the bathroom is unique. The cabinets are frameless and mirrored and doubles as a medicine cabinet. Yes, there's a washer/dryer unit too. Can't wait to get this thing up and running! 🚿🛁 PS: who can spot the difference between the shower curb tile and the actual flooring? Both two different types, sizes, and manufacturers of flooring! Needless to say, we were stoked with how well it ended up matching 😁! Oh and...interested in cost/materials? Check a previous shower post for all information! 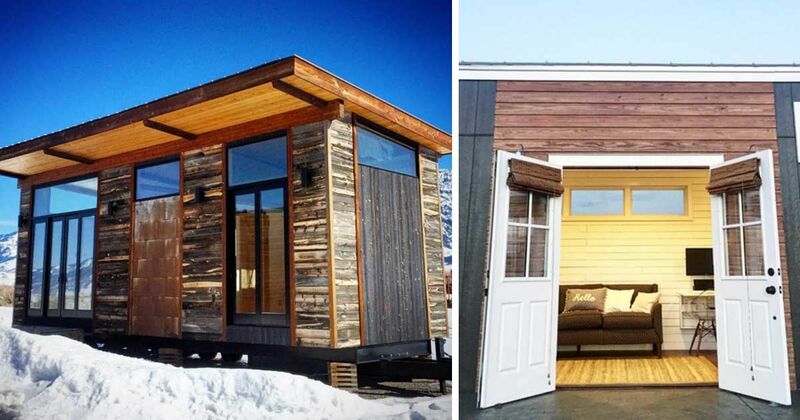 If you liked this tiny home, be sure to SHARE it with your friends!